For those living in Sutherland and suburbs, such as Illawong, Menai, Sylvania, Cariangbah, Cronulla, Engadine and Helensburg often have to get their gutters cleaned as soon as the summer arrives because trees, such as Bottle Brush and Native Flora start to shed leaves due to strong winds. Many of the homeowners end up with damaged roofs because gutters get clogged and stop collecting water. The solution? 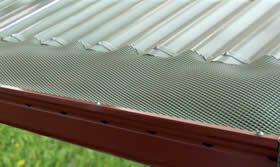 Leafshield gutter guards. Accumulation of debris in the gutters not only causes clogging, it also causes a lot of other problems like blockage of gutters, risk of fire, and internal flooding just to name a few. Internal flooding occurs when the gutters stop collecting water, and fire starts when leaves from the burning trees fall on the roof and gutters. If you also face the same problems and want to keep your roof intact, then you may want to give a shot to Leafshield Gutter Guards Sutherland. What features do Leafshield gutter guards have and how can you benefit from them? This is the question we are going to answer now. How To Keep Gutters Safe? Leafshield manufactures and supplies different kinds of gutter guards for homeowners. Homeowners can install these gutter guards to keep debris at bay and improve the collection and drainage of water. These measures can protect gutters by blocking out birds, snakes and vermin throughout the year saving you a lot of hassle and money on repairs. You can also contact Leafshield to get fireproof gutter guard meshes installed. When installed, they prevent fire embers and fine leaves like pine needles and bottle brushes from blocking the gutters. Gutter meshes also are ideal for the protection of gutters. If you are looking for a way to protect your gutters from fire hazards, we highly recommend that you go for Leafshield gutter meshes. Some of the recommended options are given below. No matter whether you need gutter guards or gutter meshes, you should try out the Leafshield products at least once. Leafshield is known for its quality products, which you can see on the “products” page. Once you have done your research, we highly recommend that you get gutter guards installed to get peace of mind when summer approaches.